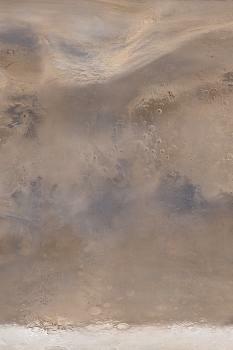 Northern Acidalia Planitia was engulfed in a continent-sized dust storm in mid-May 2003. This composite of Mars Global Surveyor (MGS) Mars Orbiter Camera (MOC) daily global images shows the early autumn dust storm (top 1/4 of the picture) sweeping east-northeast (toward upper right) across the northern plains. Dust storms like these are common in early autumn and generally last about a day or two. This simple cylindrical view of Mars covers regions from eastern Kasei Valles/northeast Tempe Terra (in the upper left), to central Arabia Terra (center right), Argyre Basin (lower left), Noachis Terra (lower right), and the northern edge of the retreating south polar seasonal frost cap (bottom). Sunlight illuminates the scene from the left.